When East Coast surfers plan their week around the surf forecast, most simply base their decision on the swell direction, size, and local winds. Under most scenarios this is enough information to get a grasp on what the region is doing, however when the East Coast receives long-period swell energy things get decidedly more complicated. The East Coast usually receives swells between 5-11 seconds which offer a fairly even distribution in size across locations open to the incoming direction. For example, a 3-4ft mid-period south swell in Sydney will come in around that size across all south-facing beaches, and a 3-4ft mid-period east swell, the same across all east-facing locations. Yet when the period ramps up to, say, 15-16 seconds, and a proper groundswell hits the coast, then that pattern breaks down and similarly exposed spots can vary considerably in size. One south facing beach may be 6ft, while the other just up the coast struggles to reach 2ft. The reason for this is that long-period swells 'feel' the ocean floor and its various irregularities, be that canyons or sea mounts, well before the swell reaches the coast. Long-period swells are produced by strong, prolonged storms, and their kinetic energy travels well below the ocean surface. Swells start to feel the ocean floor at a depth equal to half their wavelength, and this wavelength can be calculated by taking the swell period, squaring it and multiplying by 1.56. So for a 10 second swell it only starts to feel the ocean bottom at a depth of 78 metres. When looking at a 16 second swell though, it starts to feel the ocean floor at 200 metres. And a 20 second swell will start feeling the ocean floor at an incredible depth of 312 metres. If you've ever had a close look at the bottom topography (know as bathymetry) around the world, or even at your local surf break, you'll see that the ocean floor rises up from depths of kilometres to the continental shelf which sits at about 100-150m before then grading slower to the land. Small features like canyons from ancient river flows lead towards certain regions and these are what start to influence long-period swells well before we see them approaching the nearshore zone. 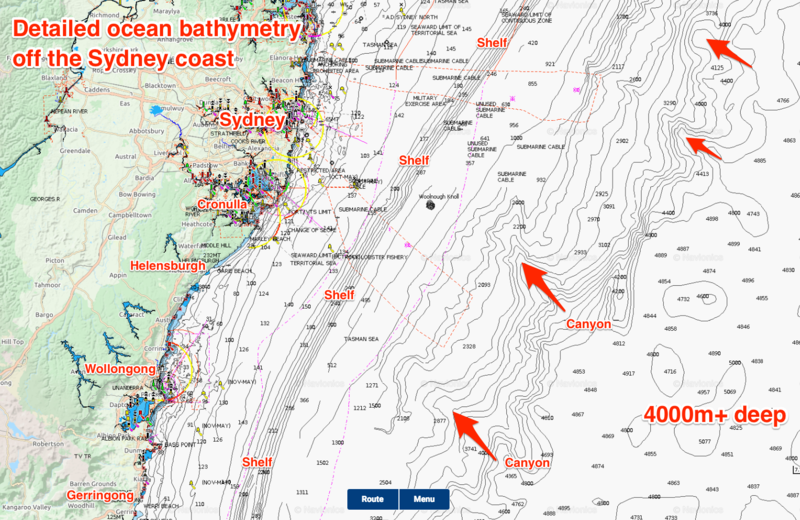 With long-period swells 'feeling' the ocean floor at depths to 200 to 300m one can easily visualise how a canyon at this depth would focus a swell towards one part of the coast, while taking the energy away from other locations. This is why Nazare is such a large and unique wave. North-west swells follow a deep canyon that cuts 700-1000m deep through the much shallower surrounding shelf, ending at Praia da Nazare. Besides allowing less swell dissipation due to bottom friction it also sees long-period swells bend in on themselves as the deepwater energy travels faster than that on the shelf, creating monstrous wedges. We don't have quite as pronounced setups on the East Coast, but there are certain locations that perform very well on these long-period swells compared to other similarly oriented zones. Now that we've got you thinking about what's happening below the ocean surface, there's one more thing to consider. Not all long-period swells follow the same path. If a 16 scond swell feels the bottom at 200m, and a 20 second swell at 312m, they're going to be steered by different bathymetric features. The best way to visualise this is to imagine the depth contours as highways; a 20 second dead south swell will be diverted to a slightly different region than a 16 second dead south swell as it will feel the ocean floor earlier. Throw in a tweak in direction and it complicates the matter even further. This is why under these long-period swell events we see the coast doing funky things, and we simply don't get enough of these swells to ascertain the patterns. Without running hi-res modelling going through each iteration of swell period and direction, it's still nearly impossible to pin down where the go to zones are. There are a few reliable locations, but as we've seen before, they can also completely miss the swell, while another location just up the coast magnifies all the swell energy. This doesn't just apply to south swells running perpendicular to the East Coast (though these are where we see the greatest effects), straight east groundswells from New Zealand are known to focus north and south of what would be perceived as a perfect bullseye right in the middle. One such east groundswell years ago was 6ft in Newcastle and Wollongong, but Sydney, smack bang in the middle, only reached 2-3ft. Over the coming week the East Coast will receive multiple long-period southerly swell pulses, each from different directions and with different periods, so it will be great to watch and see this happening in real time, especially with tomorrow afternoon's swell, coming in with peak periods of 18 seconds. And if there's a take home message from this aricle, it's to keep an open mind and be prepared to travel. Where you get those bathymetry maps. I can never any? Just added links to the bottom. I tried geoscience once but I got so lost. Downloaded some big thing and it didn't include any maps haha. Chances are I kooked it hard. Cheers! Well don't be shy, spill the beans on your Vicco theory. I brang it up once in forecaster notes, people had a problem..
yep nice one Craig ,just shows to go that you learn something every day...or should try to. Ah, sorry all those canyons are down slope of the 1000m contour and well below wave base even for our longest period swells (except for tsunamis). I would note though, most of the bathy on the shelf (in the area of interest for wave modelling) is not that good which doesn't help on the modelling front. You're correct. These features were easiest to point out for the purpose of the article so people would get a better understanding of other influences below the ocean surface. 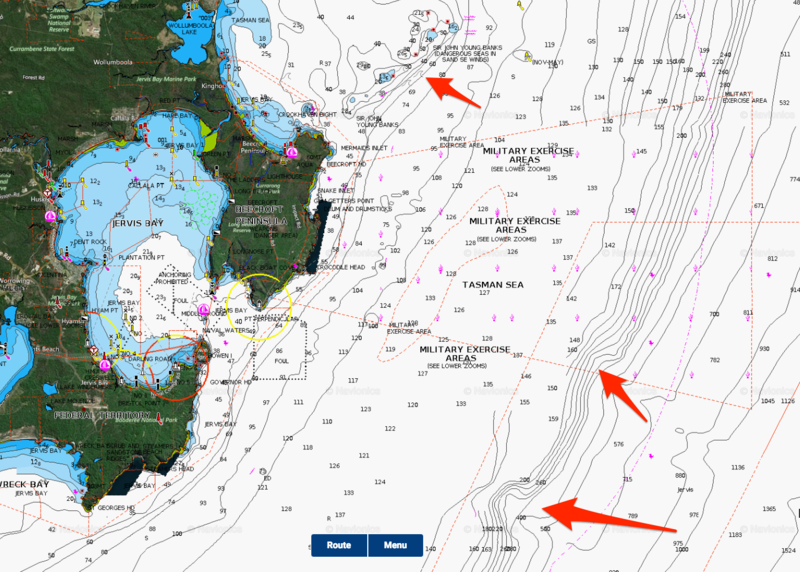 Some actual features can be seen here off Jervis Bay and inshore irregularities heading towards Sydney and the Northern Beaches. what are the depth contours on the mid-tasman ridge? It rises to about 1000m from 4000m. Insightful Craig! Eerily suspenseful as well. 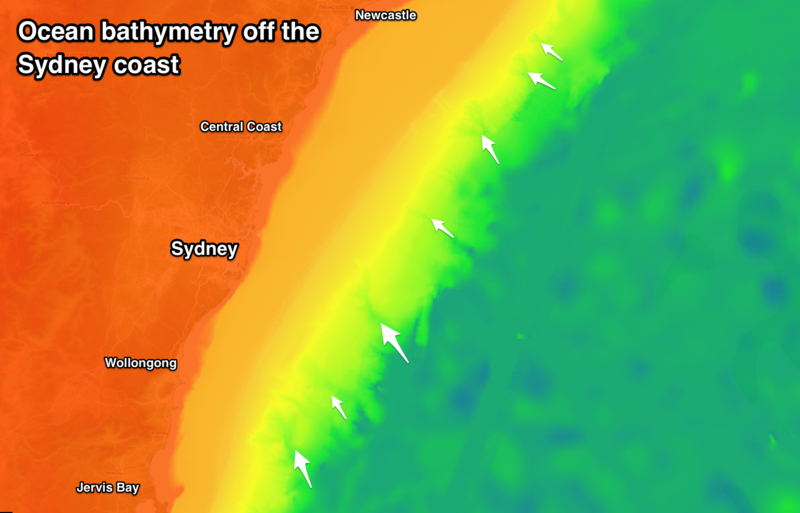 Now all we need to do is nuke King Island and get some of those 20 sec swells into Bass Straight. 1. 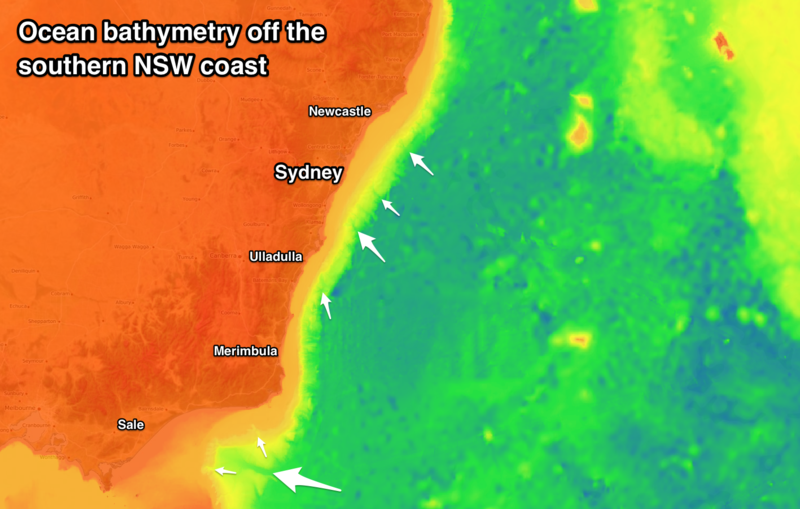 That map of Sydney shows 4km offshore depth; and the canyons that trap the swell are obviously shallower. Is there a common ratio that makes this better for big wave spots? That is, to make ratio of offshore depth: canyon depth and/or the ratio of the length that gradient has to change to force a ledge to jack-up in certain way, fro example like Peahi does? Not sure on the ratio but what you want is the shelf break as close as it can get to the spot, and as steep a gradient as you can get leading to the spot, before backing off a bit before the wave so that it doesn't full slab. Have a look around Esperance way where the granite reefs come straight up out of the ocean with the shelf not that far away at all. All mostly unsurfable slabs but very interesting. craig > will do; many thanks. will have a look and revert. I don't think it's as simple as finding an ideal ratio as there are more factors that go into creating a great big wave spot then gradient. Also, some of those factors would seem to contradict each other. For instance, as Craig's mentioned, Nazare is the product of a deep canyon that cuts through the shelf. The waves are big because less energy is lost via bottom friction and the interplay between the deep channel and the shallow shelf makes for wedges that amplify the true height of the swell. Puerto Escondido is another beneficiary of a deep canyon breeching the shelf. Conversely you have big wave spots such as Mavericks and Pipe that dont have deep water offshore but comparitively shallower water offshore. Mavs has a seamount, Pipe a string of reefs, and each serves to focus the incoming swell before aiming it towards the inner reef where it hits with greater size and force. On a grander scale, I've often wondered if this is the reason the Margs region gets so much more swell than Mandurah. Both are fully exposed to the southwest swell engine so should theoretically get similar swells, except they don't - Mandurah is always much smaller. 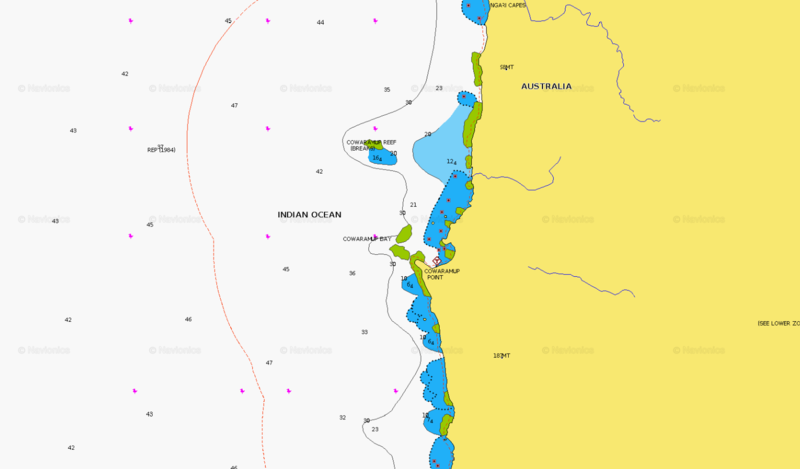 Is that because the Naturaliste Plateau, which lies offshore from Margs, directs the swell towards Margs and away from Mandurah? 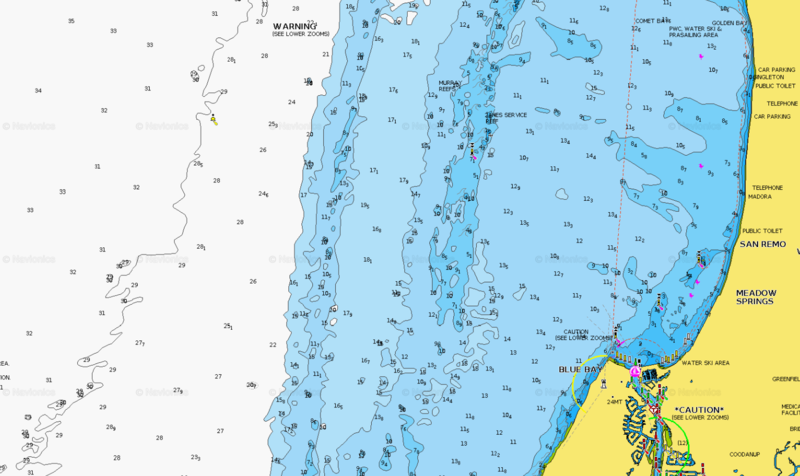 Having a look at Mandurah, there's a shallow fringing reef/shelf extending 10km+ out to sea of only 10-15m depth, so this would absorb a lot of swell. Compare it to Margs which goes from 50m to shallow right on the coast..
Hi Stu > thanks for that; what you've written adds to some of the thought's I've been having. It's an endlessly fascinating topic for me. The only reason I got onto the ratio idea, is I saw Craig's formula - Wavelength = 1.56*period^2 - and thought there may have been some other equation that I'd never heard off? Even that I might have stumbled on the golden mean of surf prediction for a minute of so - ha! In real life, I love looking a waves approaching you at a somewhat predictable line-up like Tombstones, trying to catch "the one", the one which varies by 5 degrees and hugs the ledge in a completely different way. My enquiry with Craig, is an extension of that thought process. It's awesome knowledge that you guys share on this level, greatly appreciated. I did an art work about the Cow Bommie's bathymetry in 2016; based on oral history from Camel, Antman and Damon Eastaugh - I can send you/Craig a few pics if you're interested. Yep, very interested. Feel free to email when you get a chance. I’ve been out there and sounded around. It’s an almost vertical cliff face that faces pretty into any SW swell. It jumps from 50m-ish (it was a few years ago) to 12m depth in the space of a couple of metres then tapers of slowly back to 50m over a couple of hundred metres. Think a big wedge. I’ve also been out there on a tow day. It’s frightening and my tow partner and I wanted nothing to do with it. hey drip > thanks for that info; and your honest too (about the frightening)! Gary's no scientist, so he wants to make sure he understands what you're putting out there, Craig. Say you have a short period swell, who we'll name Craig, and a longer period swell, who we'll name Gary. What you're saying is that because of Gary's extra girth he'll hit all sorts of out of the way places on the canyon (compared to Craig) and this could be uncomfortable if you haven't experienced many Garys in the past as you won't know which positions will reap the best rewards? But if you've paid attention to what works in the past, you'll have a wet and wild time to remember? Haha, that takes if for the best post! I love how this guy’s mind works. "And a 20 second swell will start feeling the ocean floor at an incredible depth of 312 metres." Craig is there a difference if the 20s swell is 1m ? To , for example 4m ? Is the depth 312m any different ? Good question, but no, it's just that there'll be a little more energy stored at that depth. Unreal post as always Craig. Thanks for sharing. Wow. That tickles my intellect for the evening. Thanks a lot all contributors. Great article, whats the significance of 1.56? Great article Craig, but trying to work things out based on period, direction and bathymetry takes you into chaos theory. 180+ degrees of swell direction, and even slight variations in direction and period will lead to large variations in outcomes. Observation over time and plenty of hindcasting will give a feel for how a swell will play out. Then there are the issues of the local banks at the time. Then there are those mystery spots that always out-perform every other wave in that region, most with no established explanation. Best left as a mystery to be revealed with each iteration, but don't let me discourage anyone from trying. Always good for the mind to try to imagine what's happening down there. what is the general rule for wave refraction vs. period/wavelength? Does a long period swell refract more or less than a short period swell? Also, for waves of the same size, do you get more refraction in shallow water or deep water (ie low vs. high tide)? Apologies if answered somewhere else on the thread and thanks. Firstly long period swells refract more as they feel the bottom earlier. And the shallower the water the more the refraction as the wave slows down and bends as it 'feels' the bottom. So is that a major factor when it comes to Victorian conditions or do these things have a minor effect in real world conditions? I'm thinking a double bonus effect in lower tide / long period swell? Felt compelled to comment (normally all I ever do is lurk, lurk, lurk, lurk). Not exactly sure where Shipsterns is but it looks like one great big shelf off southern Tassie. For those boffins on the sunny coast, there was this report commissioned by the State a little while back. Click on the report link, and click on link to full text for Appendix 1. The relevant images are on pages 17 and 18. The Sunshine and Sunrise are clearly visible. As well as a few shallow features offshore I had no idea about north of Stumers Ck, off Maroochy R. mouth. Didn't realise the headland at Coolum extends so far out either. You talking East Coast? No main reason is because we're not exposed to storms with enough strength to generate noticeable size at these periods. Swells do lose energy once they hit the shallower water, but still make their way to shore, and if there's enough size, it'll show in wave height. Rewind to Mid 2017 & two similar big calls were made by experts in their field . 1) Dr Karl Kruszelnicki AM (Australia) reports Rouge waves take down ships in the Triangle. 2) Randy Cerveny (U.S) Climatologist reports of Massive Microburst waves in the Triangle. Fast Forward to now...mid 2018 and a similar call being made on Rogue waves. 3) Dr Simon Boxall (U.K) Oceanographer reports of Tri storm Rogue waves in the Triangle. Let's be clear here the Sargasso Sea rotates it's own clockwise gyre possibly whirlpools. Little known is that dual whirpools can randomly reverse flows dueling an upward swell. Hurricane Alley rotates counterclockwise winds to transform currents into Cyclonic waves. Crazy to think there's enough force to sink a Bermuda Triangle Navy without new theories. Firstly Dr Karl's 'Rogue wave' was born from researching case files. Now Front Page News. Secondly Cerveny is also a likeable rogue weatherman of similar note to Dr Karl. His Rogue Wave theory fills out the off season during mostly colder upper temps. When storms(notably wind patterns) rapidly collide or die they produce sharp air bursts. These Microbursts chorus the ocean to collide 40- 100ft waves. Noting the instant massive sink trough instantly counters skyward like a Spout. That alone effectively conjures a menacing wave to take out any craft from any realm. These sudden waves come to an abrupt end. So sharp & sudden only sat'tech can locate. In case your wondering...They peak for less than a minute? I'll come back to that. Boxall's Tri peaks Rogue wave theory is tested in wave pools with ship models. Storms from N/NE + S/SE + W/NW (Rarest) combine to first dome then Peak a Rogue Wave. With pressure from all sides the only way is up! Mother of Rogue waves could wavecano to 200ft erupt for 20 secs...thanks for all the fish. Now add surfable 200ft vorticing wave beneath and its a 400ft x 50 km surfvolcano. How to snare a beast: 1st we whip up some Devilish triangulated waves then surf lessons. Kid's Inflatable pool & round skim board is all you need. With skimboard commence plunging down thrust in centre of pool. Notice the rebound inward force is colliding centrally then scaling skyward. In less than 1/2 a minute you can generate waves to shame our current ocean. Council sized circular wading pools can easily generate 10m high waves. Only goes to prove that the sky is the limit for ocean going wave height. Tri-peak surfers must first flow up the Wavevolcano Dome. Madly circuit the Cone Frame-Surf Mall fountain Barrel or lazily reverse twist the barrel. Now plummet the 100ft air drop back downunder to Davy Jones Locker. Rebound the flume to fountain the caldera wake surfing your tamed beast back to shore. Video 2 (Japanese Wave Pool generates Waves in any Shape) < Try this if link fails. Typical Manga WavePool makes Heartwaves & Starwaves. (WSL custom job?) *Round Pools! Video 3 (Weird Wave in Bermuda) Your typical backyard Bermuda Triangle mystery wave. Aka, the wave that never ends!!! On sale now... aka the sale that never ends!!! In a nutshell!!! The naturalist buoy picked up an anomaly in the last big swell, sea and swell both over 12m. Microburst or rogues possibly. That buoy reading of 12.20.m was an error according to hindcast of expert Oceanographers . Plus the 14.66m sea also an error*. It did get to 9-10 metres though - broken, we can estimate by using the "all buoy" graph. The best representation of the size showed at jurien which was about 6m 20s at peak size. That went on to indo and uluwatu and the "biggest ever" waves ridden there. *At the same time the albany buoy was showing 0.5m @ 30s . Another error. OK thanks Clam. Jurien did get over 7m @ 20s, and your right I see Albany went down to 0.05m @ 24s, same error. Rotto made about 7m @ 18 sec, and Albany a couple of days later near on 8m @ 20s, a big swell anyway you look at it. Hi Caml, Thanks for your input, it's interesting stuff. Good point on the "noise" from the wind, I always just suspected that would be picked up in the Sea as opposed to the swell, but if the wind is capping the tops of the swells, then yeah it may push the swell heights larger than they really are. I got 20s on all the buoys except Esperance, only seen it get up to 18sec. That CN reading was a blow out when I saw it, it just doesn't fit in to what was happening at the time, I have never seen the sea larger than the swell either. And how's the variability in the swell direction of the Cot buoy when it was nearing it's peak ! 12m swell would have been a record for sure. I just checked a few years fro the Nat buoy and it generally peaks between 6m to 8m in any given year. I have all the history for several years for all the bouys from a personal research project I was doing at the time. I don't have the data for the last couple of years though, it's a bit of a mission to get it but it can be done. They don't vet the annual data until about the end of the first quarter of the following year, so theses errors from this swell won't be "fixed" until early next year. For these few big swells of late, I had also taken screen shots, I could post some of the ones I have that you may be missing, but I would need basic instructions on how to do it. I have successfully posted pics before but failed miserably the last couple of times and just gave up. Hey Jamyardy, oops ive made an error. Because of so many big swells and the screen shots ive collected its just too hard for me to explain now. Ive already muddled up. Just looked over the screen shots and noticed I've blurred some things because of the swell on the 19th ! That was the one event where it was 20s on all buoy except esp. The swell heights were bigger southward eg albany on the 19th . The bigger swell on 23/24 was only 16-18s during the peak heights . Jurien was 6-7m but it was not 20s . It was up near 18s though. The period took ages to go above 16s whilst the swell hovered 6-7m and eventually did. i got a screen capture at 18s. I think this was where i estimated indo was 5m 20s . Still wondering how you got the albany data 0.5m 24s . It was so far off the chart looked about 30s ! Did you screen shot it ? Otherwise how else can you check ? OK the swell of the 19th, I think you mean the 17th for WA and probably the 19th for Indo. 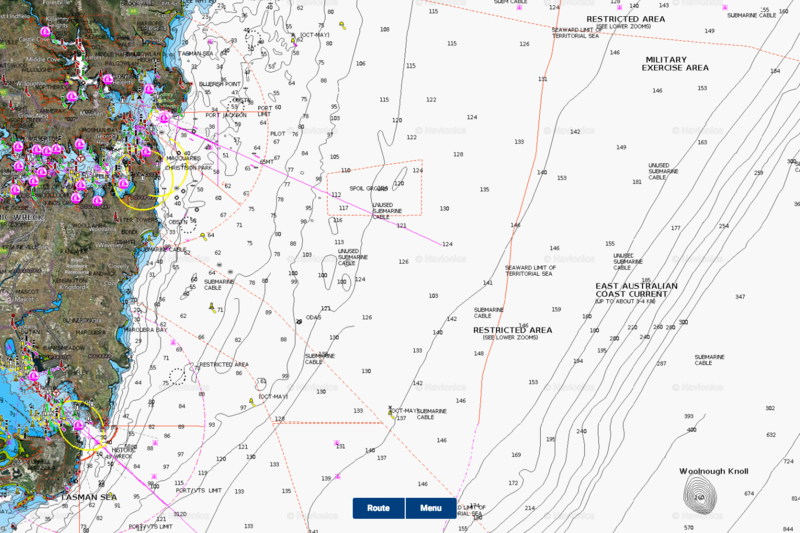 On the 17th all buoys were reading 20s, except Esperance which got to about 18s. On the bigger swell 22nd through 24th, all buoys were also reading 20s at some stage except Esperance which again got to about 18s. Yes on the swell of the 17th the Alb buoy peaked earlier and had a larger swell than the west coast buoys, and it was opposite on the swell of the 23rd where the west coast buoys peaked earlier and had larger swells. On the 23rd Jurien showed 7.21m @ 20s, so it did get to 20s on both swells. I have a capture of this. As for Albany the screen shot shows 0.05m at pretty much 25s, it was way off the chart, I just extrapolated the 4s circles out, and estimated 24s, but relooking at it is a bit more. Sea at the same time was 0.03m @ 2s. So surely this was an error. Thanks jamy, yeah it was 17th sorry..
Muddled up with so many screenshots of different buoys. I must have missed some peak moments of the max size peroids, Sleeping on the job !